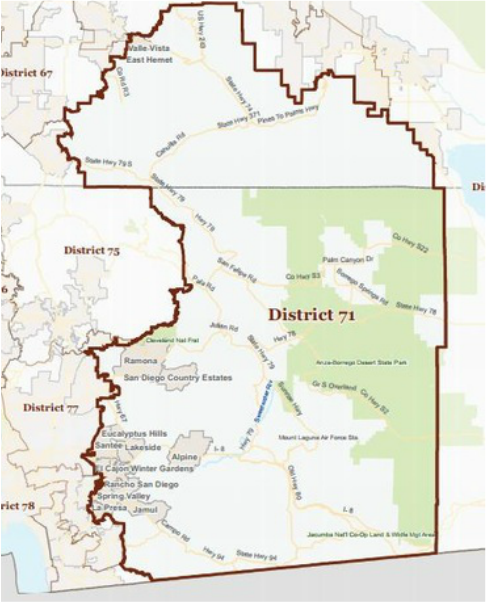 Republican Brian Jones currently represents Assembly District 71 and will be termed out in 2016. This will be an open seat in 2016 and a Republican is very likely to be elected. Since his election to the Assembly in 2010, Assemblyman Brian Jones quickly earned a reputation as a strong fiscal conservative and a vocal advocate for a smaller, more responsible government. He has been a fierce opponent of the rural fire “fee” (tax) because of its disproportionate impact on East San Diego County and Southern Riverside County residents and rural citizens of California. He has challenged special favors for public sector labor unions, and his robust defense of the Constitution and the Second Amendment has garnered state-wide attention. During his first term in the State Assembly, Brian found himself shaking his head at the nonsense that surrounds the Legislature and would then ask, ‘Are You Kidding Me?’ This catchphrase turned into a weekly video segment, which has since garnered statewide media attention and speaking engagements. His articulate commentary and leadership abilities earned him the appointment as Chairman of the Assembly Republican Caucus in 2012. Brian currently serves as the Vice-Chair of the Assembly Business, Professions and Consumer Protection Committee and is a member of the Assembly Governmental Organization, Utilities and Commerce, the Joint Legislative Ethics Committees. Brian’s deep convictions in free market principals, the need for government reform and tax relief comes from his service in both the public and private sector. His background as a businessman and his service as Councilmember and Vice Mayor of Santee strengthened his resolve to restore decision making to the local level and to insure that tax monies meet community needs. Brian has been a Santee resident since 1978; he attended Santee Elementary, Cajon Park Jr. High, and Santana High School. After graduating, Brian attended San Diego State University where he earned a Bachelor of Science Degree in Business Administration. He and his wife Heather both grew up in Santee, chose to begin their family there and have lived in the same community ever since. In his spare time, Brian enjoys mountain biking, off-roading, swimming and spending time with Heather and his three children. Brian has made it a priority to reclaim California’s status as the "Golden State" of opportunity, innovation, and jobs.